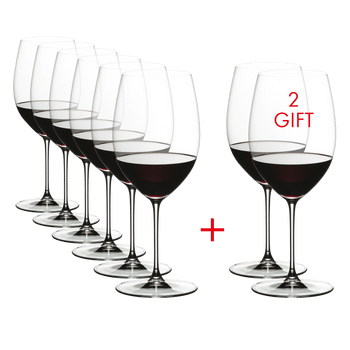 This set contains 4 pieces RIEDEL Performance Cabernet and 1 piece RIEDEL Decanter Performance. The items will be shipped in a neutral brown box. The exclusive and only for a short time available glass set of the technologically advanced glass collection Performance is offered at an attractive price advantage. The Performance Cabernet showcases the majestically structured red wines in all their complexity and finesse. Performance is the first RIEDEL wine glass series ever to feature bowls with a light optic impact, which not only adds a pleasing visual aspect to the bowl, but also increases the inner surface area. The machine-made decanter Performance distinguishes by an elegant and complex design. RIEDEL whole-heartedly believes all wines - young and old, red, white or sparkling - can be enhanced by decanting. All RIEDEL glasses are dishwasher safe.